Oats, as well as making a nutritious porridge, is one of the best remedies for “nourishing” the nervous system, particularly when one is under stress. Avena sativa is one of about twenty five different species of oats in the family Poaceae (Gramineae). Avena is the Latin name for oats and sativa means sown or cultivated. The mature seed of the oat plant is used as a popular cereal grain and is harvested in late summer or early autumn. The ground husks surrounding the mature seeds become oat bran. Eating oats and oat bran is a positive contribution to anyone’s diet, providing vitamins, minerals, fiber, protein, & complex carbohydrates in abundance. Herbalists use the premature, “milky” seed . The seeds are harvested, usually in late August, depending on geographical location and growing season, while they are in a liquid or “milky stage”. At this time the oats have the highest concentration of nutrients and active chemical constituents. These constituents include starch, alkaloids such as avenine and trigonelline, saponins, flavonoids, sterols, β-carotene, vitamins B1(thiamin), B2 (riboflavin), D, & E (tocopherols), as well as calcium, mucin, and silicic acid. The fresh milky oats are then extracted in a solution of grain alcohol to be used as a nervine tonic. Herbalists also make use of the oatstraw, which is harvested after the mature seeds have been collected, and it is cut up and used to make tea. Milky oats extracts are one of the best remedies available for treating nervous debility and exhaustion, especially when associated with depression, stress, and mental and emotional fatigue. 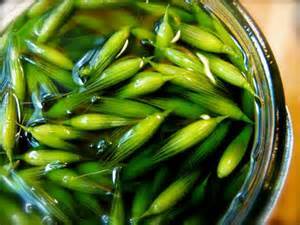 It is used as a nervine tonic to strengthen the whole of the nervous system. It can be taken for recovery from nervous and emotional exhaustion with accompanying depression and lethargy, or it can be taken as a preventative measure when coping with stressful situations. When treating nervous exhaustion, keep in mind that one should avoid caffeine, nicotine, alcohol and illicit drugs since they all contribute to the problem. Stress management and relaxation should be emphasized.Milky oats can be used safely on a daily basis and have no toxic side effects or drug interactions. People with Celiac’s disease should not use any oat products as oats contain gluten. Oats have also been used traditionally in topical applications. Oatmeal baths are quite popular treatments for many external skin conditions such as poison ivy, poison oak, rashes, eczema, shingles, chicken pox, and sores. I have been using Milky Oats Glycerite, since buying it from David Winston. I now make the product to sell to others. It is wonderful at keeping your nerves calm and easy going. It has done amazing things for people suffering from shingles, hives and other skin “itch burn” disorders. ← Vegetarian Awareness Month – The Power of Veggies!